This one’s probably pretty easy. 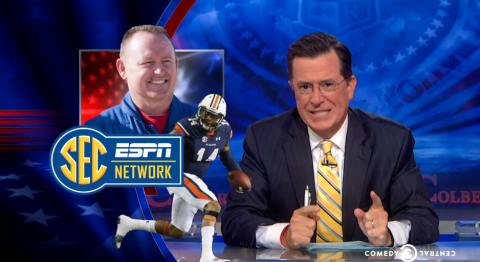 Stephen Colbert’s doing this thing on astronaut Barry Wilmore requesting that NASA convert the International Space Station into what Colbert called an SEC Network-receiving “orbital bro pit”, and it really doesn’t matter whether the graphics producer guy knows anything about football or not. Because when it comes to “what image best represents the SEC?” these days, Auburn is either going to be the first thing to pop in your mind or up on your Google search. SEC Champs, yo. You can watch gazillions of more Auburn references and in pop culture here.